Michelle Maguire Hobbs is PKU News’ Staff Dietitian. She’s also an adult with PKU. In honor of Thanksgiving, she’s written about why she’s thankful. This past weekend I was fortunate to be asked to speak about estimating phe content from food labels and the work of How Much Phe at a Tennessee PKU Foundation meeting. This got me thinking about how much PKU treatment has changed since I was a child, and made me realize there is so much I am grateful for. I was born in the late 1970s and medical practice then was to discontinue diet at age 10. I was also told I’d never be able to have children. There were only one or two formula options at that time, lancets were painful to use, and low protein foods were unpalatable. Formula was by far my greatest challenge. It was terrible. We tracked my diet with pen and paper, with the green binder as our guide. 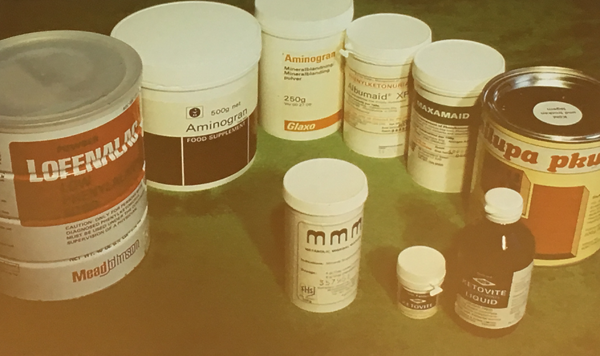 (At right, staples of the PKU diet in the 1970s; Photo courtesy of a presentation at the 31st Annual European Society of PKU meeting, 2017). Slowly, things began to change. By my teens, “diet for life” was the standard, and next version of the Low Protein Food List for PKU had been released — the maroon binder, followed by the maroon book, and finally HowMuchPhe.org. I attended Emory University’s PKU Camp, which helped girls and young women with PKU understand that they could safely have children. Today, I look back and have a feeling of gratitude for where we are with PKU treatment. I am thankful for the many options we have for formula and for the companies that make them possible. I am thankful for the newer lancets that make taking blood levels more convenient and less painful; I am thankful for the plethora of good tasting low protein food options and recipes. They may require more time and effort, but they are delicious, healthy options that we did not once have. I am thankful for Kuvan (despite the fact that it didn’t increase my phe tolerance) and the many drug therapies in the pipeline. I am thankful for the researchers, organizations, dietitians, and doctors that work tirelessly every day for us. I am thankful for social media and the friends it has enabled me to make within the PKU community. I have not always felt grateful. For years, I wanted nothing to do with PKU and resented having it. I cried many tears associated with PKU. I’ve failed to maintain my diet at times, and I hope that the damage I have done is not too severe. I can only move forward and apply what I know. PKU is not easy, and it is not just a diet (there is so much more involved). I am thankful for what we have today and dream of more for our future! Today, I have two beautiful children and can say I don’t resent drinking my formula, Kuvan helps me feel better, How Much Phe makes it easy to look up foods and keep on track, and Cook for Love has provided recipes that my kids enjoy making and we all enjoy eating. For all these reasons, I am thankful.